Perhaps we shouldn’t really have this photo in Market Lavington Museum for Reg was born in Devizes and moved to West Lavington with his family when he was less than ten years old. His father was postmaster and grocer at Littleton Panell. Reg followed in father’s footsteps, and no doubt took plenty of his own for he became a postman. However, it looks as though Reg signed up for military service during World War One for here we have him in a typical posed picture. And it looks as though Reg used this as his Christmas Card 100 years ago in 1915. We don’t actually know much about Reg, but as we celebrate Christmas 2015, we might remember that 100 years ago things were very different. Forgive the pun – but hey, it is Christmas Day and that, by now traditionally, is the least busy day of the year on this blog. Viewer numbers are usually very small. We’ll even try a low pun to get the numbers up. Now what on earth else are people doing on Christmas day? Apart, that is from seeing friends, family, giving and receiving gifts, eating, drinking and generally being merry, maybe attending a church service or some other gathering etc etc. Well, they could be out in the garden and it is a garden tool – or part of one, that we are looking at today. And yes, of course, it is a hoe. It’s a reminder of past times. These days if you want garden tools you go to a shop and buy them. Back in the 19th century you went to your local blacksmith and had one made. This hoe was made by a local blacksmith some 130 years ago. It has suffered the ravages of time – it really is quite rusty. Obviously there is no handle but it would have been quite substantial. This hoe blade is a hefty item with a width of about 25 cm (10 inches) which is much wider than most current hoes. 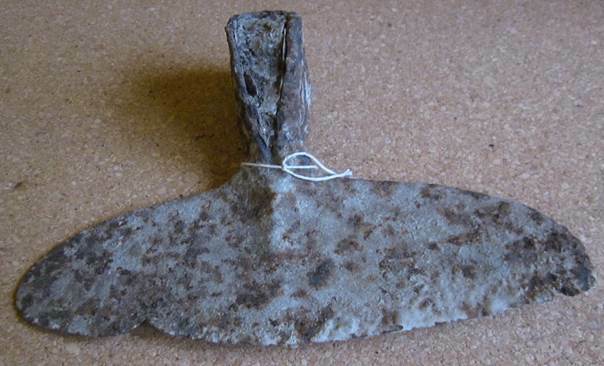 Its shape suggests that it was a hoe which cut down weeds on the push and pull strokes. Of course, neither the front nor the back is particularly sharp now. With another Santa ‘ho-ho hoe’ can we at Market Lavington Museum wish all our many readers a very happy Christmas under whatever name you care to call this season of the year. 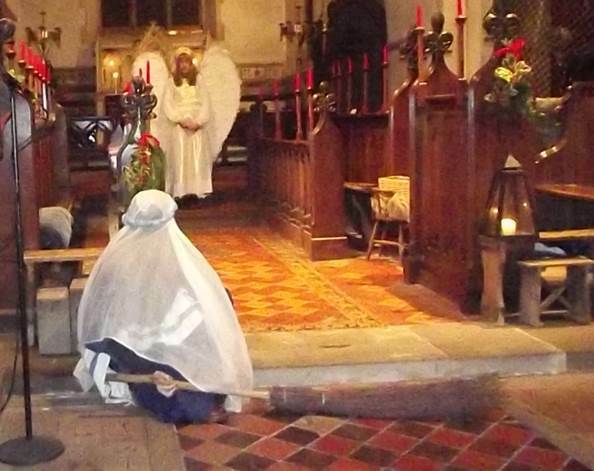 The Real Nativity has become an established part of the run up to Christmas. This year it was blessed with good weather which meant it could take part – where appropriate – outside. 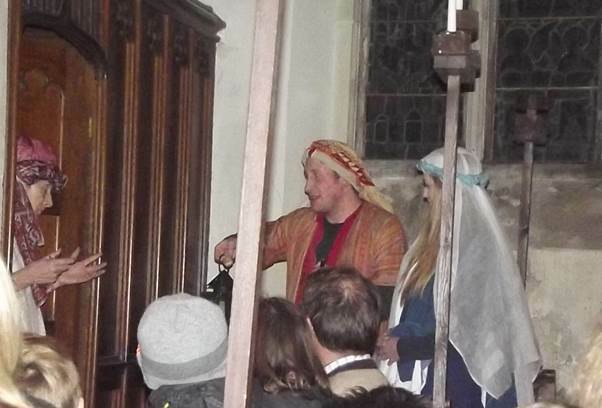 However, performers and large congregation gathered in the church where we start with Mary doing the chores. 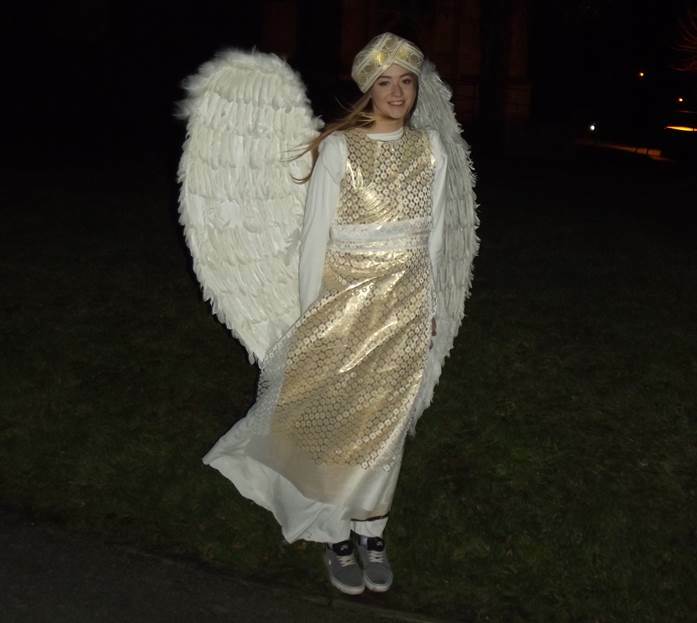 She is joined by the Angel Gabriel who tells her she will have a child – the son of God. Joseph is understandably concerned that his fiancée is expecting a child but he sees Gabriel in a dream and is told all is well. They order everybody to go to their home town for the census. They are a fearsome duo so they are obeyed. 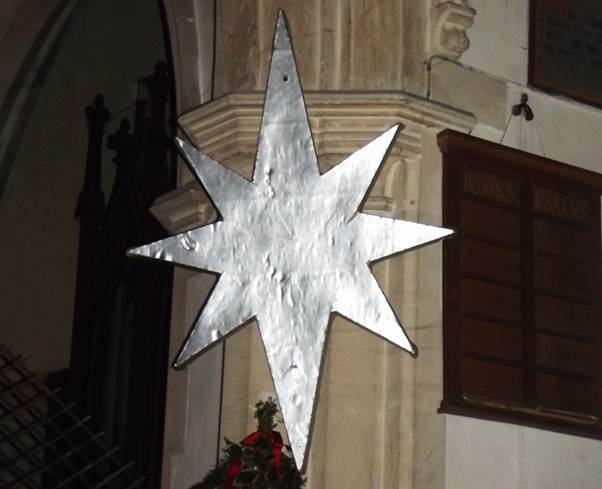 The people of Bethlehem congregated in that town. Members of the cast can, of course, join this throng. The angel kept a watch over all although maybe that wasn’t part of the original story. 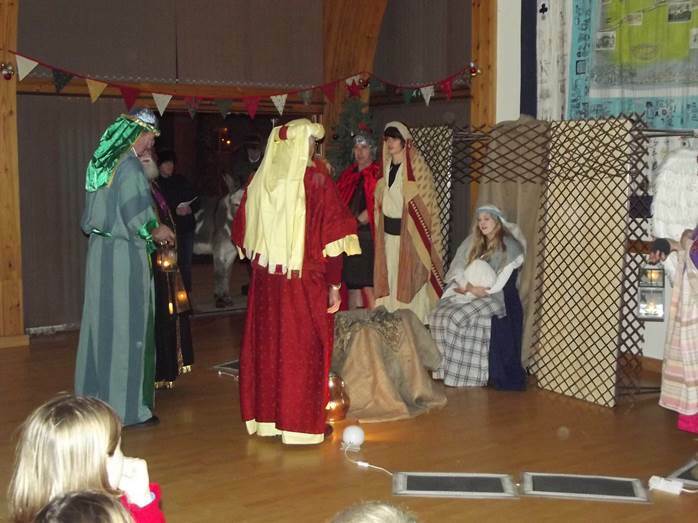 Joseph arrives in Bethlehem with Mary. She is ‘great with child’ and is riding a donkey. Eventually, a kindly inn keeper says they can bed down in the stable with the animals and leads them away to this makeshift shelter. Meanwhile shepherds, out in the flock minding sheep are trying to keep warm. Aha. 21st century health and safety applies. There’s a real fire so there had better be a real fire extinguisher. 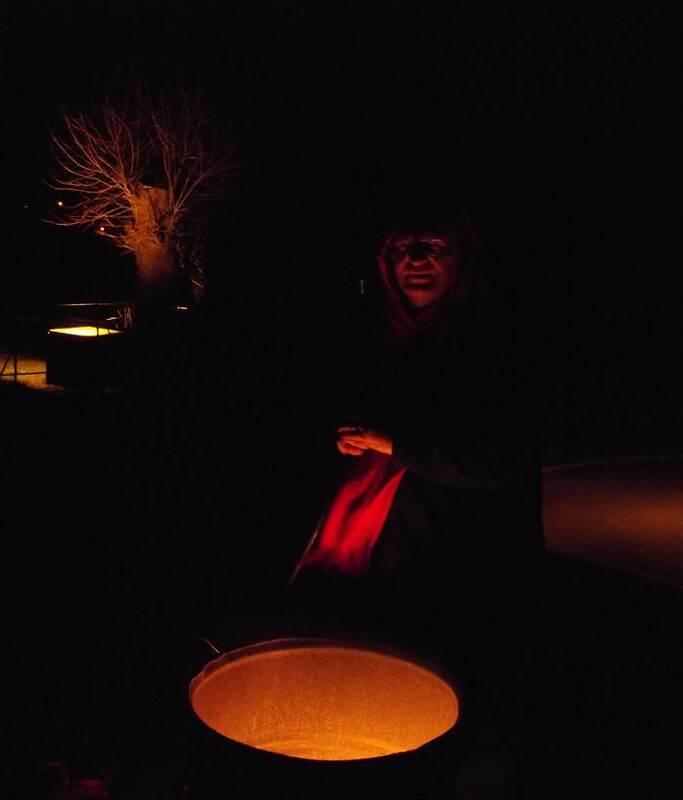 Or our photographer can hide it by just using the glow from the fire. 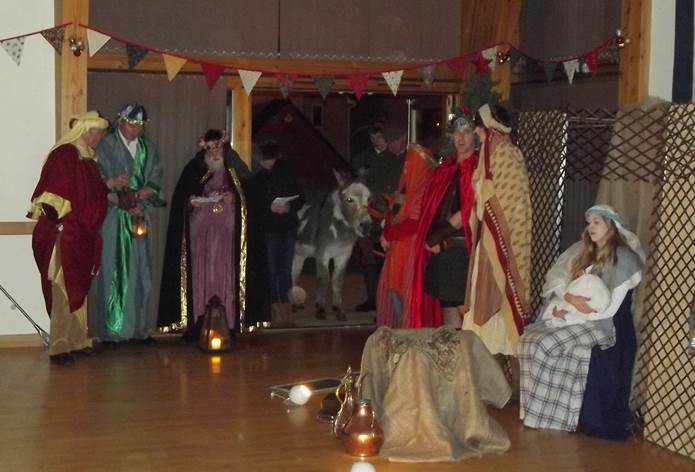 Shepherds arrive in the stable (AKA the Community Hall) where Mary has produced the baby Jesus. They pay homage to the baby Jesus. 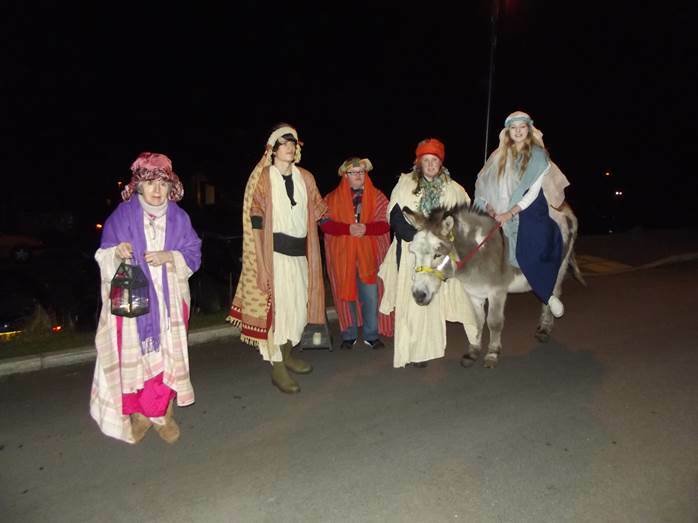 The donkey joins the onlookers. 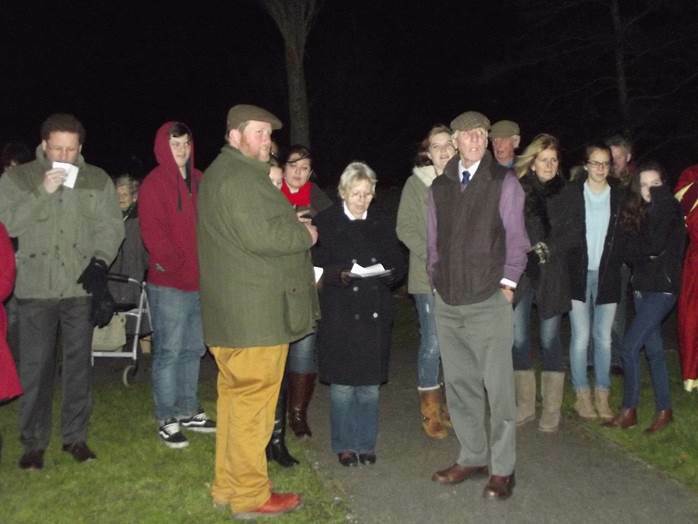 During the action, the villagers have been singing approriate Christmas Carols and we ended with a wonderful rendition of ‘Hark the Herald’. Well that wasn’t quite the finish. Mulled wine, mince pies and a good old chinwag were much enjoyed by all. We at Market Lavington Museum are pleased to make these photos available for participants in the event to download. In case any aren’t aware, larger versions of photos can be seen by clicking on them. Bert Shore has featured a few times in this blog. Earlier this month we looked at a very old multi-tool he had – something which may have originally belonged to his grandfather. 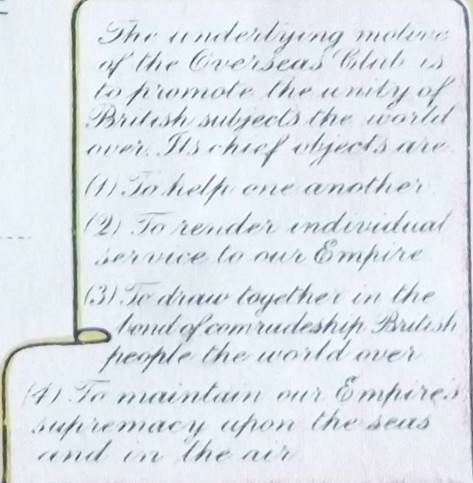 Today, we look back again to Bert’s own childhood and his involvement with one aspect of World War One – The Overseas Club. The Patron of this club was His Majesty the King. That would be George V for we are looking at 1915. 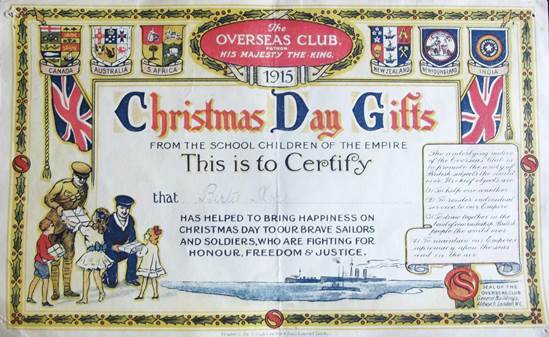 And here we see Bert’s certificate for Christmas Day Gifts which helped to bring happiness to brave sailors and soldiers. The aims of the Overseas Club are explained on the certificate. We also have the banners of six empire countries. It is interesting that India sent many men to fight for the allies at a time when British soldiers were based in India to attempt to keep order. We also note that Newfoundland was a country in its own right. It did not become a part of Canada until 1949. Once again, we do not know what Bert Shore actually did to earn his certificate but I dare say men, bogged down in the mud, were pleased to know that they were thought about back home. A Happy Christmas to all our readers who celebrate this event – and here’s hoping all those that don’t celebrate have a really good day as well. 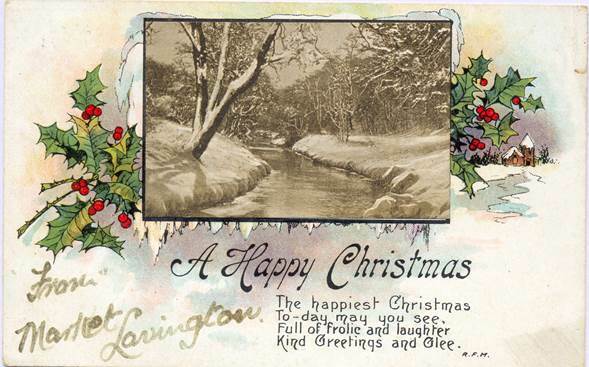 In the UK we have a long tradition of sending cards at Christmas and today we are going to look at a Market Lavington card from over 90 years ago. It takes the form of a standard postcard. 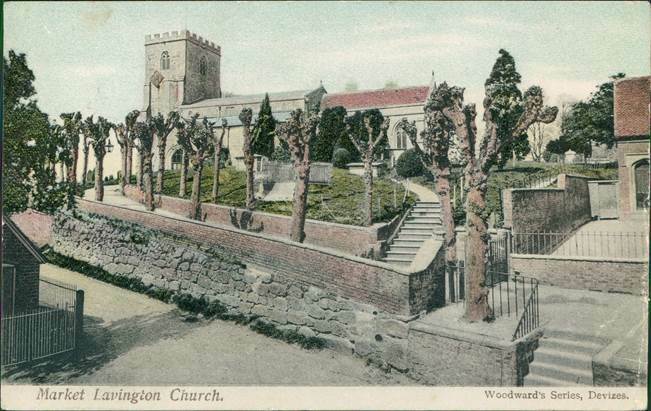 The card is one of those generic ones, over-stamped with ‘From Market Lavington’ and with a photograph stuck on. The photo is of a wintry scene – probably not in Market Lavington. 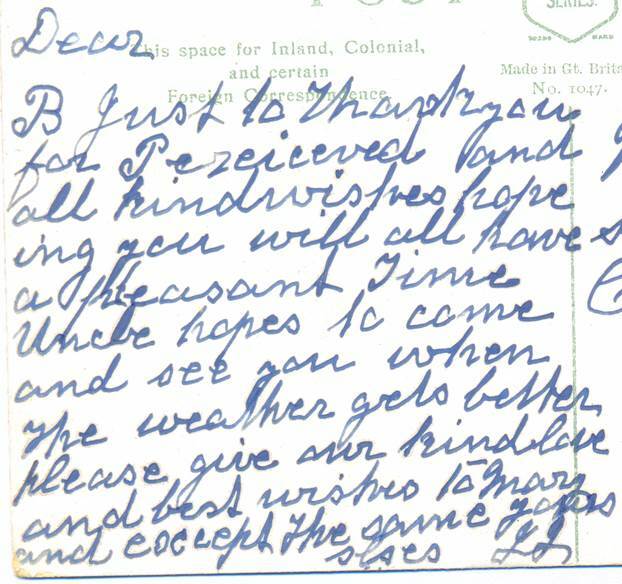 However, we assume a Market Lavington shop sold such cards and this one was posted in Market Lavington on 23rd December 1922. The name Fericker seems not to be correct since nobody of that name actually seems to exist. Chapmanslade, where the card went, is between Westbury and Frome. The message doesn’t say all that much and certainly seems very formal by today’s standards. The message. ‘Dear B’ was wished a pleasant time. Miss Fericker appears to be ‘B’. Here’s hoping she did have a pleasant time and that the weather improved so that Uncle could get over to see her. Unless Uncle was a driver in 1922/23, he was not in for an easy journey. With one change of train he could get to Dilton Marsh – Chapmanslade was a part of that parish but it would still have been a three mile walk to Chapmanslade. Of course, if anyone can identify who sender and recipient were, we’d be delighted to hear from them. That could be a little Christmas present to us at Market Lavington Museum. 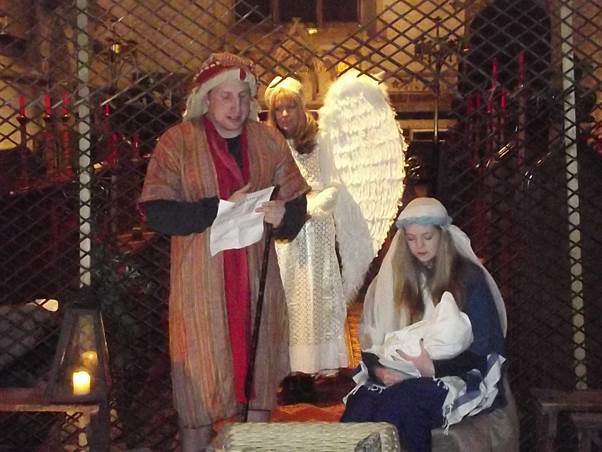 The Real Nativity has established itself as a part of Christmas in Market Lavington. The 2013 version had to be different from earlier incarnations. 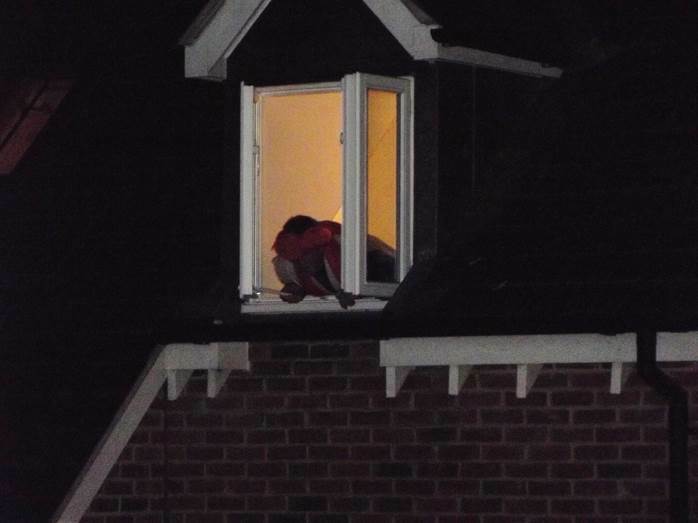 The storm lashed south of England was no place for an outside drama to unfold. 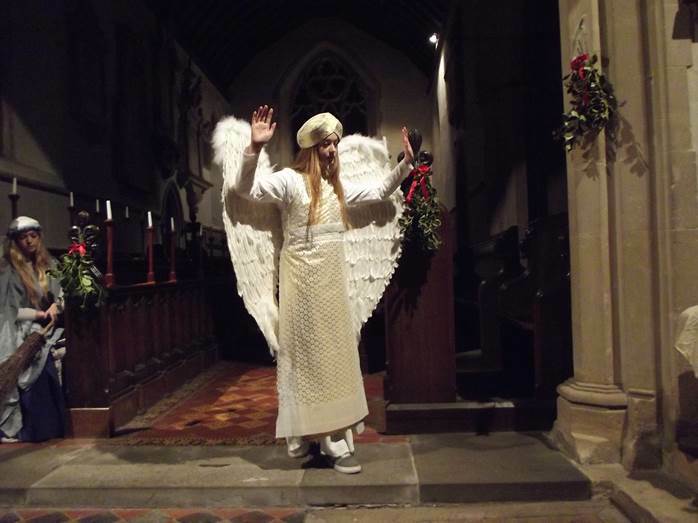 The set up was altered so that the whole performance took place within the church – a far better bet this year for both performers and spectators alike. Mary, who produces this event, and her team did a fantastic job getting a changed version ready in a very short time. 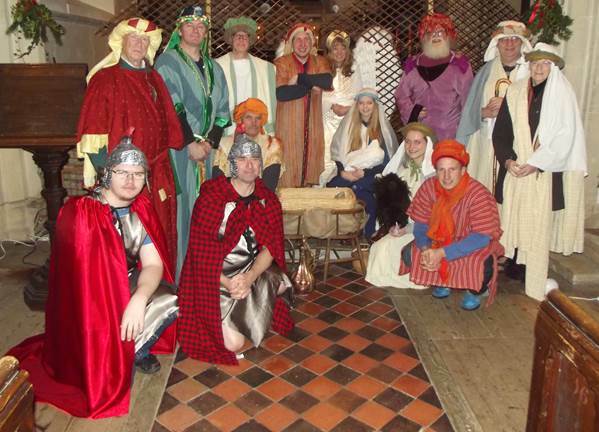 Let’s see some photos of the action, saved for posterity at Market Lavington Museum. 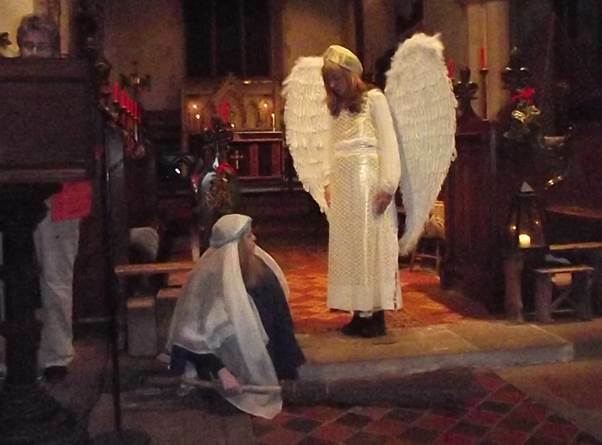 The angel appears to tell Mary she will have God’s son. Joseph sees an angel in a dream who advises him that Mary’s baby is God’s. 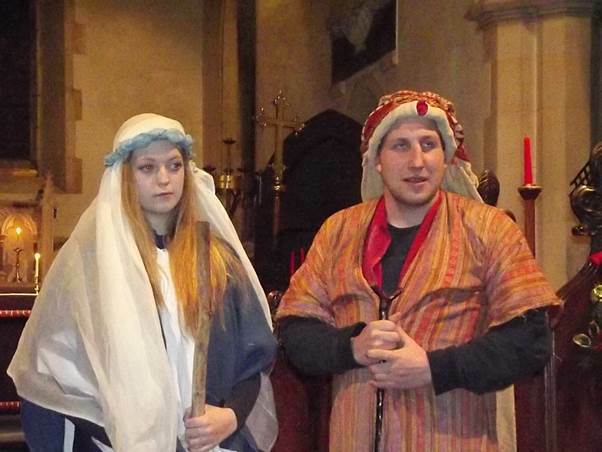 Mary and Joseph listen to Roman soldiers ordering them to go to Bethlehem for the census. The powerful performance by these Romans made youngsters cry. 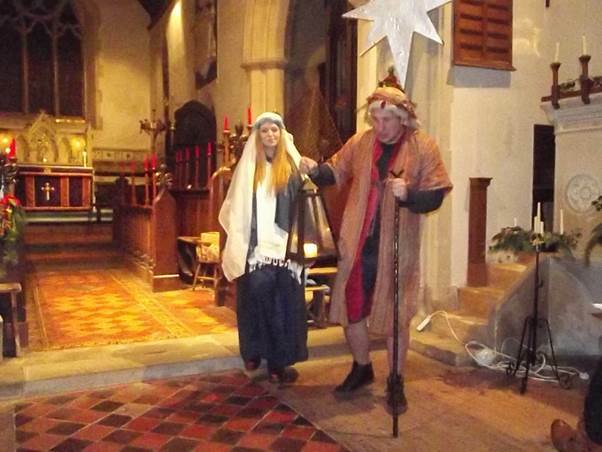 Joseph leads Mary off to Bethlehem. 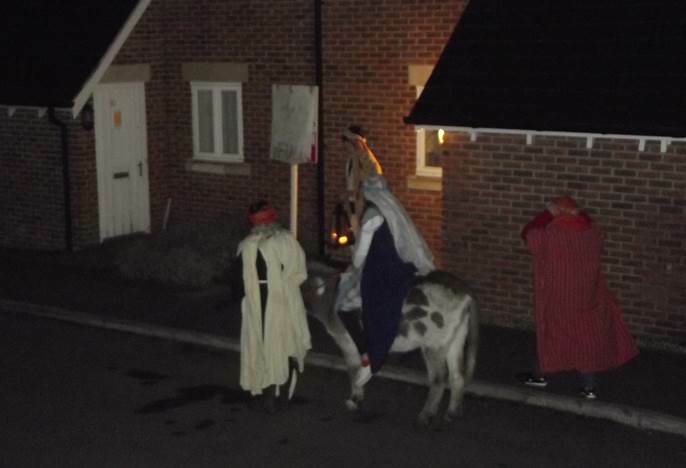 Had it been outside, they’d have had a real donkey, but for this performance they had to leg it! 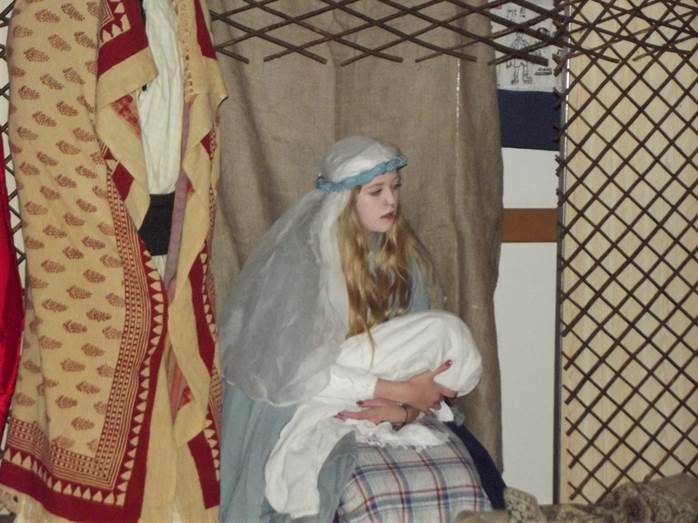 At the third and final inn they are offered space in a stable. 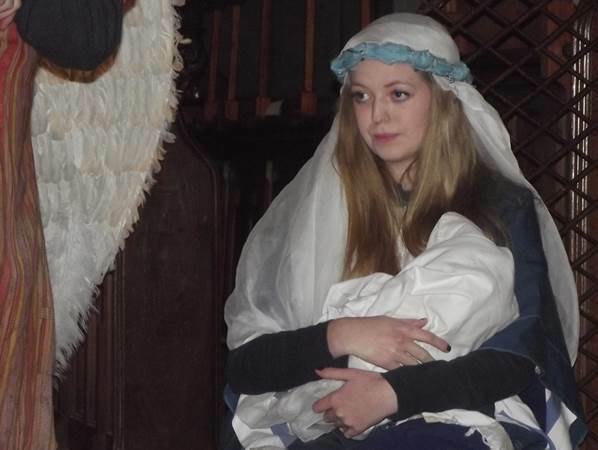 As we all know, Mary gave birth to her baby and laid him in a manger in the stable. 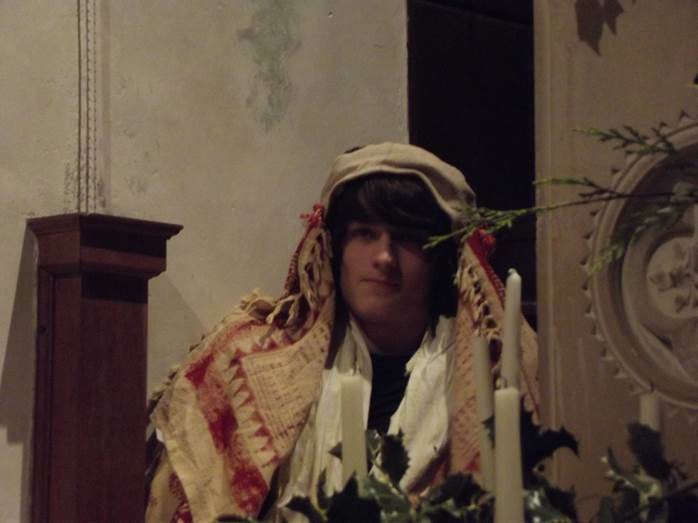 Meanwhile shepherds have been advised of the birth of Jesus and they make their way to the stable. There’s an inn keeper looking on there as well. 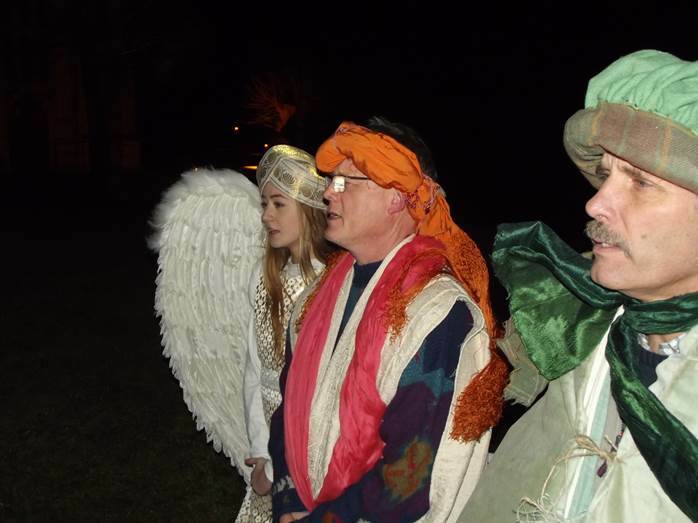 The shepherds come and pay homage to Mary, Joseph and baby Jesus. Mary cares for her baby. If possible a real baby is used but this year there just wasn’t one available or offered. The wise men pass through the congregation to bring their gifts to Jesus. The congregation are active, of course. 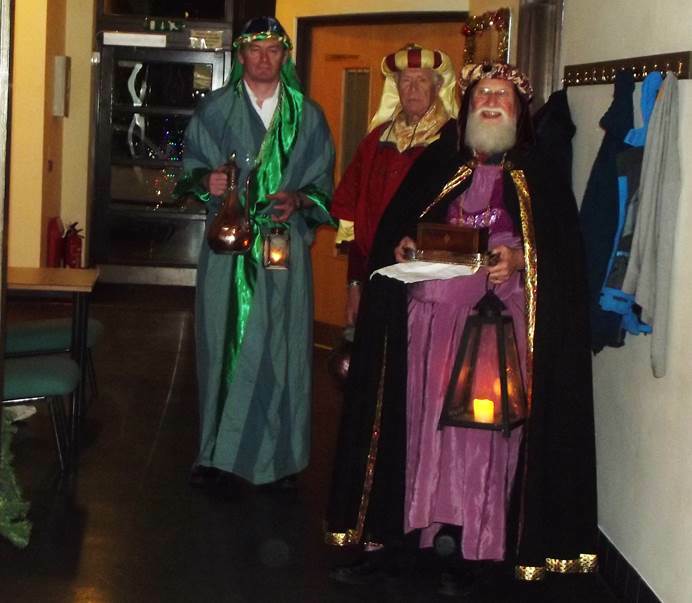 These kings arrive to the strains of ‘We Three Kings’. They are, of course, guided by a star. 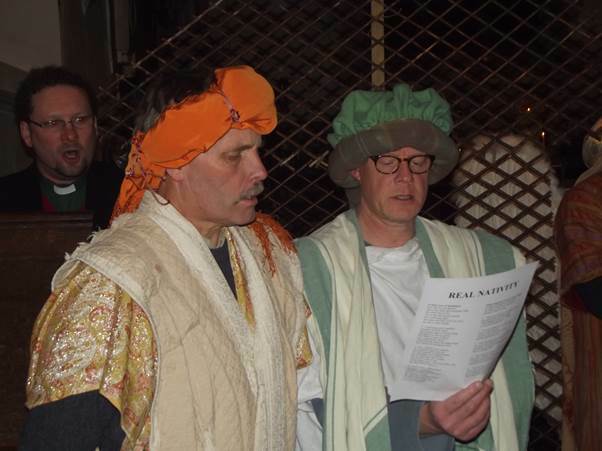 The wise men now pay homage to the holy family. 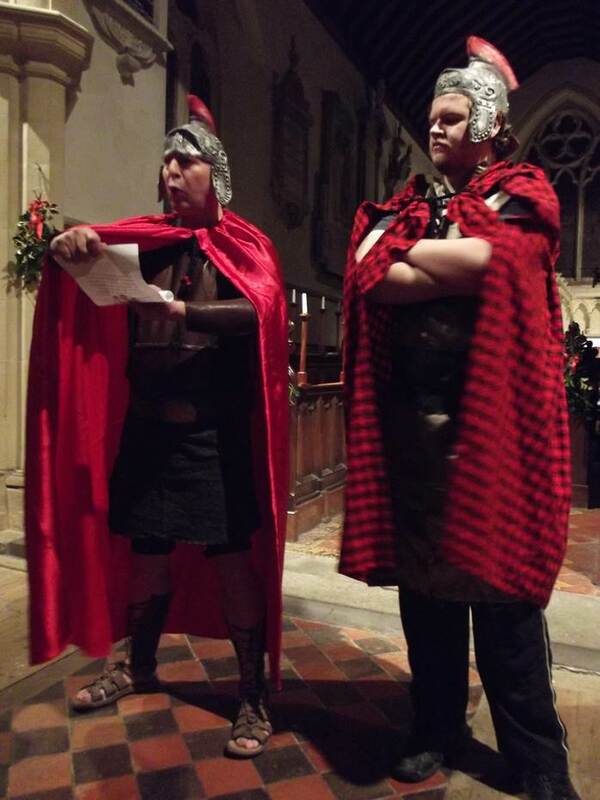 A pair of inn keepers join in the singing of the final carol. The cast take their curtain call. 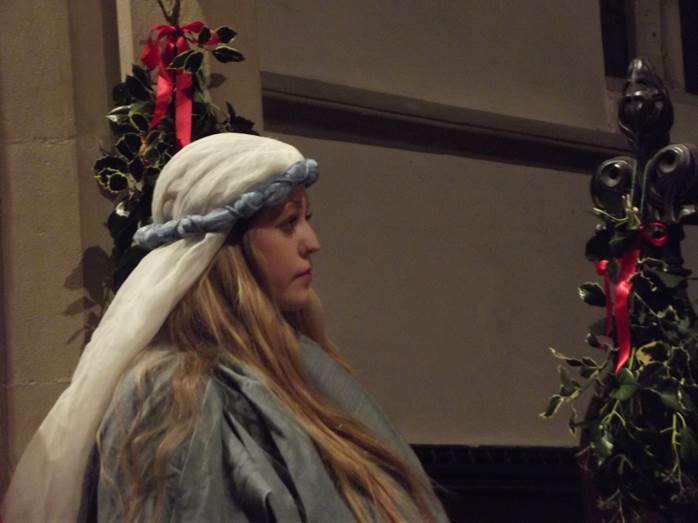 A mince pie and a chocolate for all who wanted completed an enjoyable and moving performance. The very name, Christmas, makes this a Christian religious festival to celebrate the birth of Christ. Most people now celebrate the event in a very secular way. It’s a chance to spend a lot of money, spoil the family and probably eat far too much and possibly drink far too much as well. The religious meaning of the day gets forgotten. But it wasn’t always so. 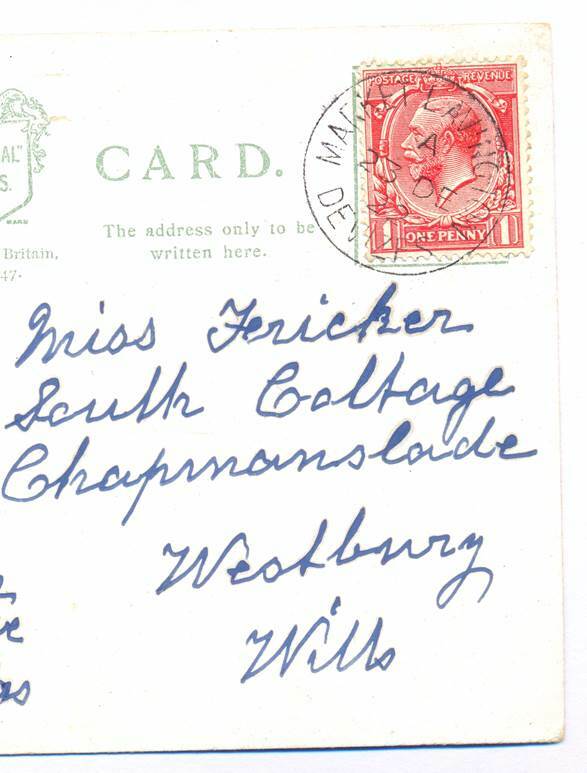 We can’t quite make out the date on this postmark but it would seem to be December 22nd 1907 or perhaps 1904. 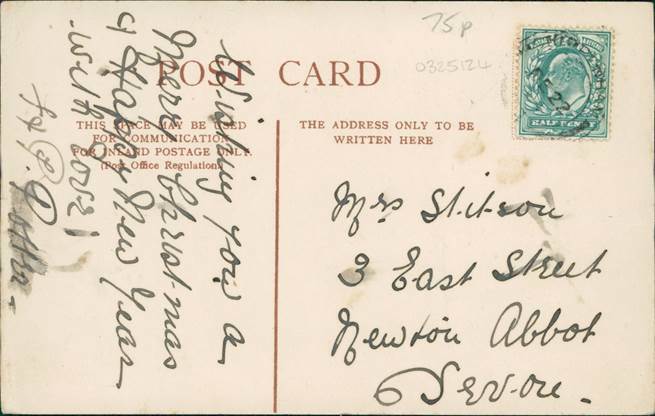 A post card wishing a Happy Christmas to Mrs Stitson – from the Edwardian era. The card was posted in Chippenham to a person in Newton Abbot in Devon. It doesn’t seem to have a lot to do with Market Lavington. But the picture does. 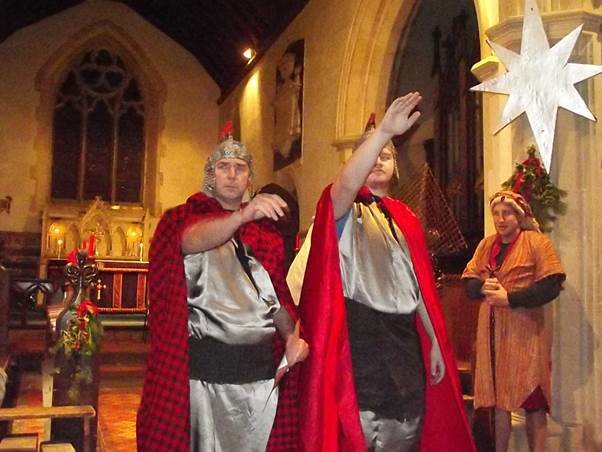 Yes, it is Market Lavington Church – an appropriate image for Christmas. But why choose Market Lavington Church unless you are connected with the village? Well, the person who chose the card were Potters by name – F and P we think. Potter was a common Market Lavington name. There were 31 Potters living in Market Lavington at the time of the 1911 census. Another five had been born in Market Lavington but lived elsewhere. Three Potters had been born in Easterton. But none seem to match the initials F and P.
But we still have a card of the church – colour tinted and used as a Happy Christmas Card. Does Christmas seem a long time ahead? In Market Lavington we are definitely catching the festive spirit now. 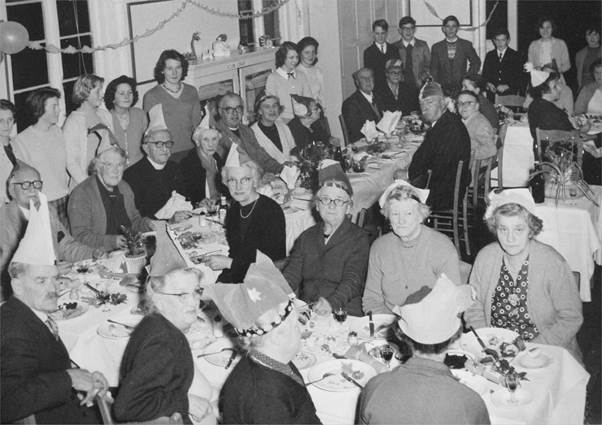 December has been, for a long time the month for Christmas events and parties so let’s take a look at a Christmas party from the past. This party took place in the school room (now the Old School) back in December of 1961, a frightening 52 years ago. It looks to feature older residents of the time with younger people, no doubt, doing the waiting and serving. There are two church ministers present. One is Reverend Daunford Davies of the Church of England whilst a second is Reverend Crewe who was the Congregational minister from 1960 to 62. Both have their wives with them. Miss Duncan, the previous Congregational minister is amongst the guest. Other guests include Mrs Hawes, sisters Nellie and Millie Hiscock, Mrs G Cooper and Mrs Annie Baker. Amongst the helpers we have Susan Shepherd and Liz Bury. 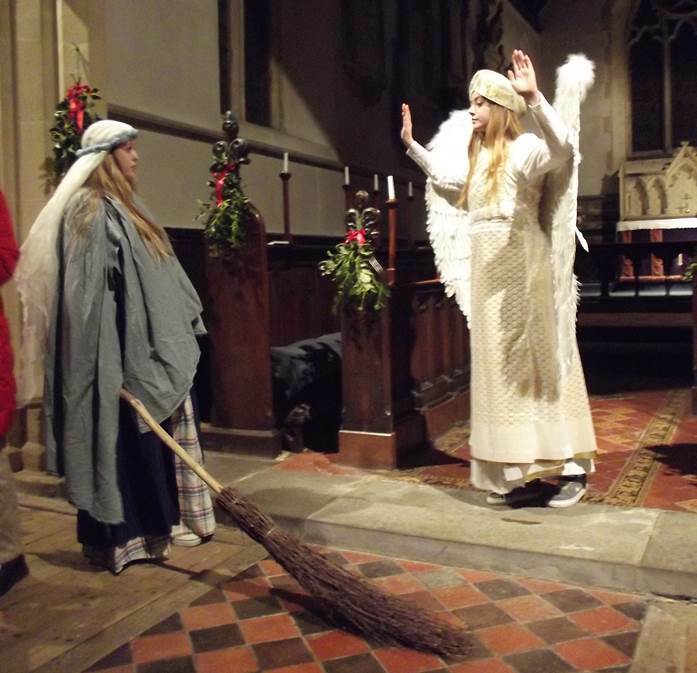 There are still lovely Christmas events in the village. A couple of days ago we had a wonderful Christmas Concert, led by the Lavington Community Choir and the Lavington Community Band, with charming help from primary school children, this time from the West Lavington (DAPS) school. 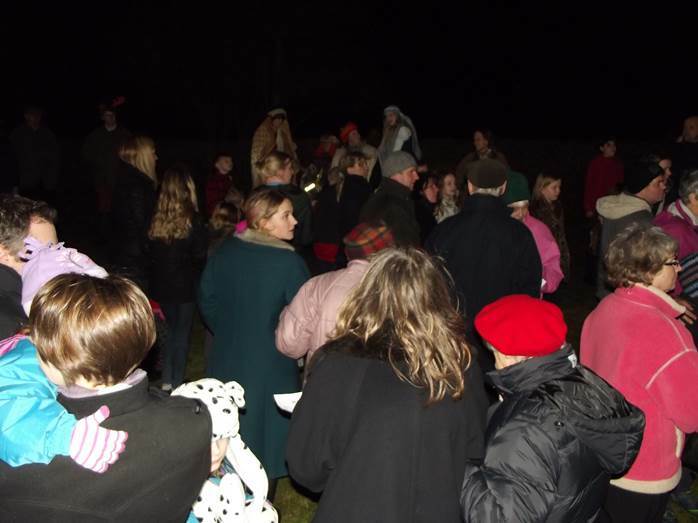 The Community Hall was packed out for a mixed programme of music which included community carols and secular songs too. It was a great occasion, really appreciated by the audience. Published in Wiltshire Life Magazine – December 1946. EVERY Christmas at Market Lavington we are enlivened by the merry chords of the village band playing the well-known carols. In the streets and in the lanes the bandsmen stand round their leader and play to us at our door. This is a custom of so long standing that Christmas without our band and carols would not seem Christmas at all. We welcome their coming with gifts of money; but years ago “the big houses” welcomed them with more than a donation. They invited them inside and regaled them with beer and eatables. When I was a boy, I looked forward to another band’s serenading on Christmas Eve, Their visit, long after dark, was an event to be looked for, and we youngsters stayed awake as long as we could, anticipating their arrival. When their music reached us, sudden and near, we were agog with excitement. We jumped out of bed to peer through the curtains at their twinkling lanterns and the bright reflections of their instruments. We loved their music, as it echoed and re-echoed on the glassy air to become a swirl of harmonious sounds, whose beauty seemed enhanced by the very coldness of the air and the uniqueness of the occasion. I recall, too, the visits of the hand-bell ringers, who always visited us on Boxing Day. 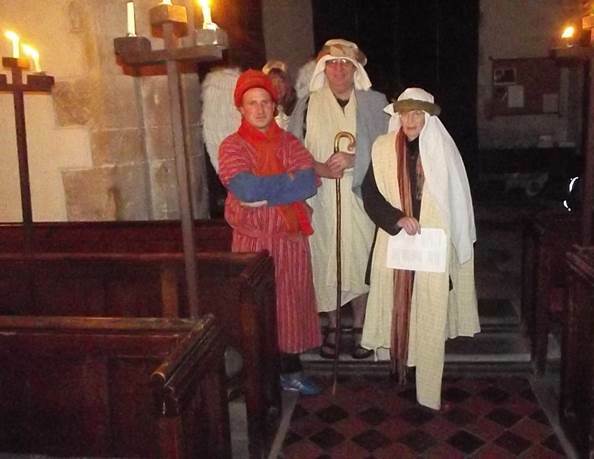 They were our Parish Church bell ringers, whose chimes had cheered us Sunday by Sunday throughout the year and this was their way of spending their holiday as at Xmas. They came to us wrapped in greatcoats and wearing mittens. They tramped from house to house in the snow, giving at each a short round or two on their twinkling bells. 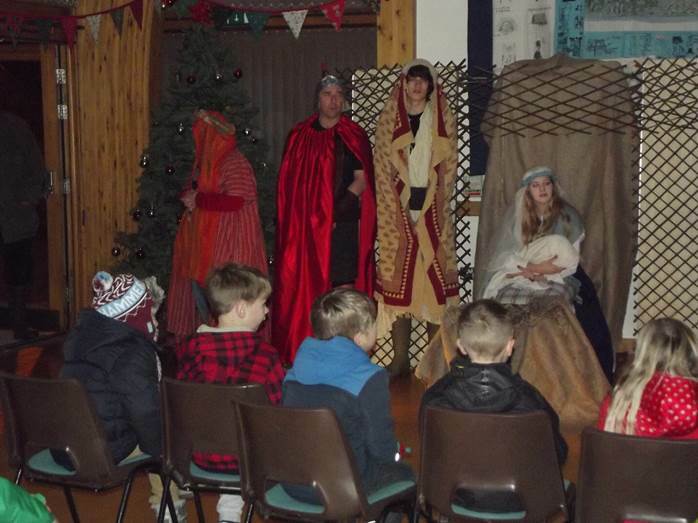 They collected quite a large sum of money and used it in providing themselves with a good supper at one of our Inns. When they visited us, they stood in a circle around their leader, who gave them brief instructions about “bobs.” As a boy, I used to wonder why “Bob” (one of the men was named Bob Chapman) should need so much attention. I watched Bob very closely, but to my untrained eye I could see nothing amiss with what he did. But still the leader shouted “Bob.” It was sometime before I discovered that the cries of “Bob” were really ringing instructions when he required a change in the order of ringing. It was fascinating to watch the eight of them swing their bells, shoulder high and then jerk them at the precise moment to swell the harmony of movements, their whole attention was fastened on their neighbours whom they watched with sidelong glances. They said nothing at all. They listened to their leader’s shouts, whose “Bobs” momentarily broke the rhythm of their movements. The chain of sounds spread upwards until the houses re-echoed their merry chimes and the streets and the lanes seemed Lilliputian Cathedral towers with their bells aswing. 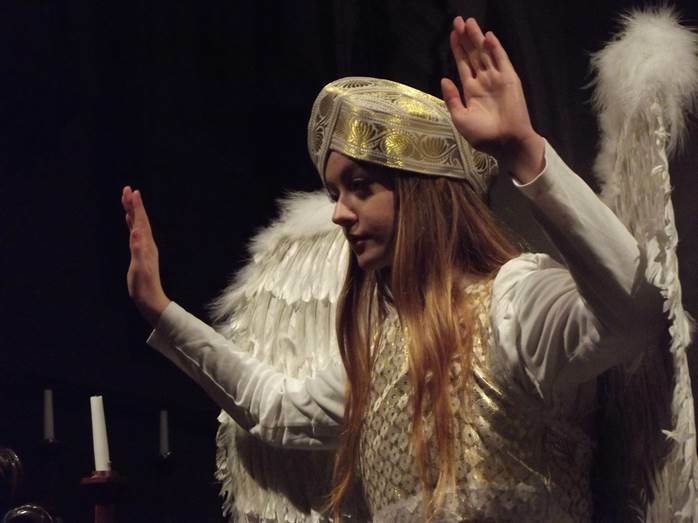 Nativity Plays are closely associated with Mumming plays, which are indigenous to the Countryside. 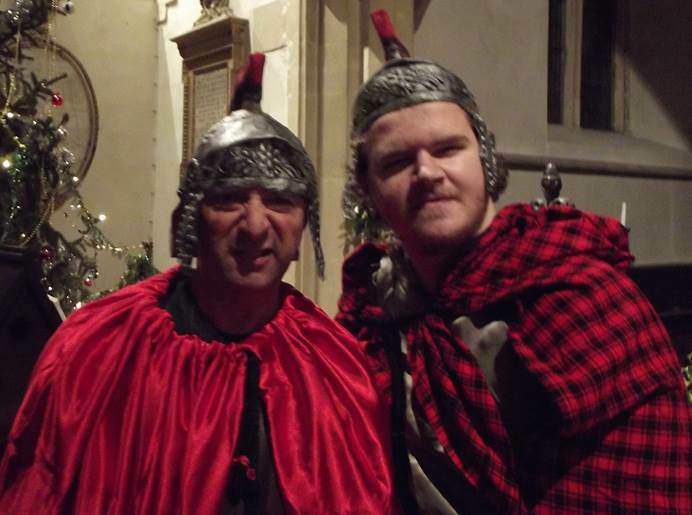 Mummers have been part and parcel of village life ever since Christianity began. Although their plays varied up and down the country, they always followed the same pattern. They grew out of the ancient plays showing Winter as Death and Spring as Life. To this was added as time went on, stories of Crusaders- stories of St. George and stories of Turkish Knights; the former (St. George for merry England) always the conqueror of the latter. 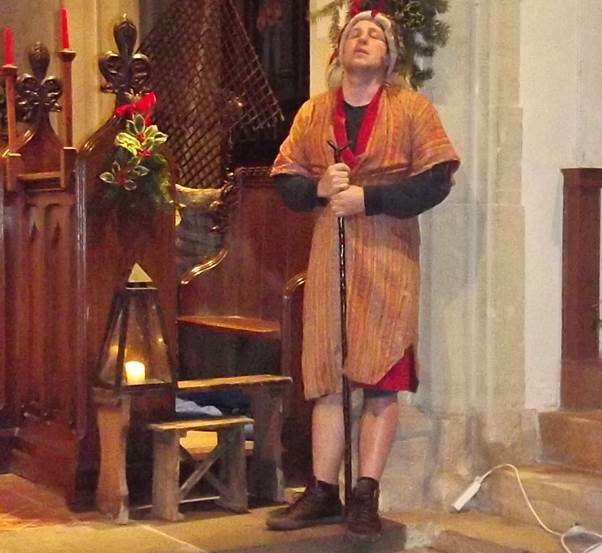 Some years ago I revived the Mummer’s Plays at West Tytherly in Hampshire, where the performers were all young people and the village audiences certainly appreciated them. After all they were intended primarily for village folks and I found that the addition of one or two famous English personages added interest to the story and the inclusion of a bit of local history gave point and amusement to the theme. The historical references and incidents need not be too exact. Neither need the story be chronologically correct. There is a great deal of scope given and taken in this kind of play. Even the language can be at times mere gibberish. The idea is to amuse the people and not instruct them. If the audience is convulsed with laughter, the players are spurred on to excel themselves and this delights all. The wit which appealed to my Hampshire folk might fall flat on a Northerner, so a good deal of licence is necessary, but reference to local people (provided they are jocular and apt) never fail to raise a laugh and always go down well. Christmas is the time of family reunions. Sons and daughters, with their children, travel from far and near to spend the festival with their parents. Paper chains are hung across the ceiling, holly and mistletoe decorate the walls, and mantelpiece is thick with Christmas cards. Sometimes the paper chains break and wreathe the heads of the people sitting in the room. The family gather around the dining room table soon after mid-day to their turkey and chicken, plum pudding and mince pies. The first part of the afternoon is spent in resting – the men in the dining room and the ladies in the parlour. The latter part of the afternoon the men spend (as they do on most Sundays) walking around the fields and looking at the stock and examining the crops. No countryman would think his walk right if he had no stick, for sticks are useful in many ways. Sticks are more than staffs in their hands – they are implements or tools, indispensable for their investigations. So the afternoon wears on until the sun begins to lower in the western sky, the men turn their steps homewards, for Tea comes in with nightfall in December. Then the lights are lit, and as many a village has no grid, the lamps with their frosted globes are set in their standards in the dining room and drawing room. After tea the tables are set out in the drawing room for a miniature whist drive. Here amid a continuous babble of conversation, the players move from table to table. The drive is a boisterous affair and not the serious game we know it can be when played in the Parish Hall with its M.C. and its many rules. After an hour or so, scores are added up and the prizes awarded. There are booby prizes too, for the lowest score and the recipients are made to reveal their prizes to the family amid much banter and copious hand clapping. Supper follows and then the young people get busy taking up carpets and rearranging the furniture. Someone volunteers to play the piano and the rest of the evening is spent in dancing. Thus, with intervals for the wireless news, the evening draws to a close amidst conviviality and fun. The party breaks up at a late hour with invitations to other parties on the morrow. The change I notice most when deep snow covers the countryside is the directness of the routes people take to reach their objective. When footpaths are invisible, the villagers plod straight across field and furrow to the Church, or to the shops; and the children do the same to go to school. Usually village folk keep strictly to the twisting paths and circuitous lanes, but a snow-covered land gives them a new-found liberty and they make straight for the smoke of their cottage fire without regard to any rights of way or Parish Council regulations. And this is as it should be. In December the Post Office becomes a busy place of work. The counters are loaded with parcels, the mailbags with letters. There you find game, rabbit and poultry neatly labelled, tied and parcelled ready for sending to distant relatives. The window of our Post Office (filled with photographs and postcards, our postmaster being a skilled photographer) looks gay and attractive. Official formality of the office is over-ruled by the homeliness of the “taking photographs” or developing “snaps.” On the side counter are piles of photographs, most of them marked “With the season’s greetings.” A village Post Office has nothing of official aloofness about it but is the friendly place we like it to be. Many villagers would rather shop in the village than in the neighbouring towns, as here they are known, there they are not. Intimate relationships make for good dealings and fair transactions. In December we find temporary postmen “sorting letters” ready for delivering. There are few secrets in a village Post Office, as all the business is done in one room. There are no separate sorting rooms, despatching departments) money order sections (and what not) found in our town offices. So all the work is transacted in the public view. The postmen are our friends) whose names we know – even their little idiosyncrasies we appreciate. One postman has a professional interest in garden flowers and my wife and he exchange plants) or seeds. If we have seedlings he likes, we present him with some and if he thinks our garden would be improved by the addition of some plant or other he not only suggests their inclusion but also presents us with them. Officialdom in the village is not so apparent as in the towns because small numbers make life more communal and personal. I find but few turkeys being reared this year in the villages for the Christmas market. Before the war, a hundred or two were reared each year in my own village alone and about the middle of December at least a day was spent killing the birds and despatching them to London. One by one the birds were hung up to a barn beam and killed by a swift twist of the wrist. It is a curious fact that turkeys which are so delicate to rear when young are so difficult to kill when fully grown. As adults they become the tyrants of the farmyard and delight in lording it over all the other birds. Should an ailing hen allow herself to be caught unawares, they are sure to peck her mercilessly to death with their axe-like beaks. They “gobble-gobble” up and down the farm and its lanes all day long until the December butcher arrives. Then peace returns to the farms for a few months until the spring brings with it the squawk and squeak of the young turkeys once more. If the turkeys are gone, geese have come to supplant them. Geese are easier to rear and they are becoming the favourites of the small- holder and even of the cottagers with a piece of grassland at the back of their houses. Near my house a few geese have been reared into fat plump birds ready for the table and they should make good eating at Christmas. In the country Christmas is a pretty lengthy business. For the school children, it begins in October when they start to make their Christmas toys. They fashion gay soldiers out of cotton reels, miniature dolls-house furniture from padded matchboxes, and workmanlike warships from boxes “scrounged” from the village shops. The more competent of the boys make complicated aeroplanes, tanks and guns from odds and ends of wood so skilfully that any London Store would be proud to display them on the counters. The members of the Young Farmer’s Clubs, too, have been busy since September (when their Winter programme opened) making model poultry houses, miniature sheep cribs and wattle hurdles for their Christmas Exhibition: These have been constructed in their workshop where their instruction in rural handicrafts has been interspersed with visits to local craftsmen who have co-operated in their training. One or two of the older members have worked in the Village Smithy under the friendly eye of the Smithy himself; They have been preparing for their blacksmith’s badge and on the anvil have learnt something of the ancient craft of the country blacksmith. There they have forged “shut” links, angle plates, hooks and eyes. They have drilled and countersunk screw holes. They have welded links into chains, made rings for “bitels” (the countryman’s name for the- large wooden mallets found on every farm) and “shut” (welded) the irons for the scythes. And all this work has been done with a view to their Christmas show, held a few days before December 25th. The W.I. Choir too, began their Christmas preparations in October, when they commenced in the Schoolroom their practices of the less known carols. 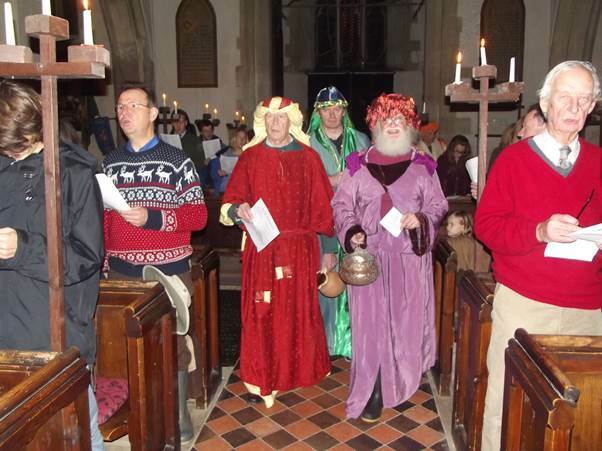 Here week by week they have met in the gathering twilight and rehearsed their parts under the baton of the Vicar’s wife; and here (or in the Village Hall) they will have their service of carols at Christmas to which the Whole Parish will be invited. Most of the cottagers have made other Christmas preparations as long ago as September when in their garden they erected their fattening coops in which one or two young cockerels have been pampered into the giant birds they now are, almost ready for the Xmas dinner. The gleanings of corn, gathered by the children from the harvest field have supplemented household scraps to make them these fine robust birds and many a cottager would prefer his Christmas “chicken” to even a turkey. The more fortunate of the villagers who have a sty at the bottom of the garden have anticipated Christmas even longer, for in mid-Summer they purchased a couple of weaner (piglets about two months old) to fat for Christmas. In my younger days, every cottager possessed a sty. It was small in size; but great in importance. The pigs were of the greatest interest to the whole family and even to the neighbours. The pigs changed the household and garden waste into bacon for Christmas, which when well salted and “cured” kept good and fresh for many weeks during the Winter months. Any Sunday morning in the autumn the villagers could be seen leaning over the wall of the pigsty, studying their animals or discussing them with a friend. The disappearance of the pigsty is one of the things to be regretted in our village life and in spite of the effort of the Small Pig Keepers Council, its re-appearance is not so widespread as we should wish. With its going, many cottagers lost a topic of conversation and a thing of mutual interest with their neighbours. Had we taken steps to maintain this useful village institution we should have been the better prepared to meet the menace of starvation which faced us in 1940. 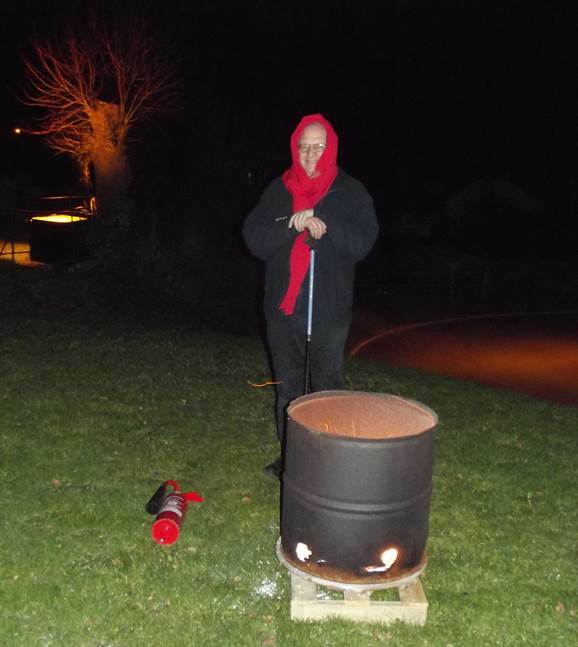 But most villagers have long ago secured their Yule logs. In early autumn they obtained loads of legwood (the countryman’s term for the long branches left where the timber merchant fells his trees). My family have been busy at the sawing horse with the cross-cut and even my small son, aged nearly eleven, has been with his miniature hand saw converting the branches into small logs for the parlour fire. He and his elder brother have built a tidy stack of logs “seasoning” in the shed. Timber cut in September is full of sap and it is best to let the logs dry out (or season as we country people call it). They will be ready for the fire early in December and we look forward to sitting around our log fire this Christmas. Country folk for countless years have enjoyed a log fire at this season and there is nothing to beat the merry crackling of oak logs on a winter’s day. So for country people, the thoughts of Christmas, (like the thoughts of youth) are “long-long thought” and the rural mind is occupied with them at intervals throughout at least a quarter of the year.